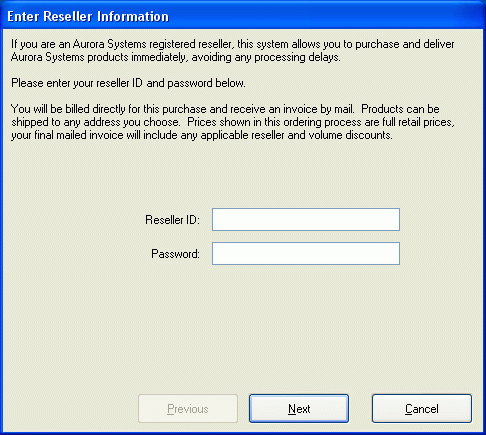 If you have selected the I am a registered Aurora Systems reseller box on the Retrieve Pricelist page you will be prompted to enter your Reseller ID and password. If you did not check the box, you will skip to Select Payment Means. Please carefully protect your reseller password, as it confirms your identity as an Aurora Reseller and its use conveys your authorization for Aurora Systems to charge purchases against your company's account. If for any reason you think your reseller password may have been compromised or lost, please contact Aurora Systems customer service IMMEDIATELY to prevent any unauthorized charges against your account. Warning: Make sure you are very careful entering the Reseller ID and password, these will not be verified until you submit the purchase for processing, and an error may cause your purchase to be rejected. Enter your reseller password. The password will not display, asterisks will be shown for each letter typed. Press Next to submit your information and proceed to the next step. If there is an error in the information or you have not entered all required information, you will not be able to proceed.